Can Hearing Aids Fight Dementia? This month’s World Alzheimer’s month seeks to raise awareness and challenge stigmas related to dementia. The 21st September will be the most important day to note as this is World Alzheimer’s day with plenty of events happening worldwide to educate people about this the effects of dementia on loved ones and the families surrounding them, and what we can do to help if our own family members are affected. Alzheimer’s disease is the most common of dementia, afflicting up to 90% of people who have the disease. No cure currently exists for it. Common early signs of the syndrome are difficulties remembering information. This is because Alzheimer’s disease first attacks the part of the brain that controls learning. It eventually travels to other parts of the brain, leading to mood and behavior changes, confusion about time and place, and even unfounded suspicions about other family members. As action groups worldwide gear up for World Alzheimer’s month, many are talking about how to best prevent the disease. Aside from studies into high blood pressure and obesity as possible causes, some are claiming that hearing loss could be a contributing factor. At first glance, connecting hearing loss to dementia might be as ludicrous as claiming that prescription eyewear can help with your chronic back problem. But further inspection reveals some surprising results. There was a study recently conducted by Frank Lin, an otologist and epidemiologist at Johns Hopkins University in Baltimore. His investigation tracked overall cognitive abilities of almost 2000 adults with a mean age of 77, for 6 years. Those who started the study with significant hearing loss were 24% likelier to see an adverse effect on their cognitive abilities. This goes against common perceptions that hearing loss has no effect on other areas of the body. The conclusion of this study was that hearing loss seemed to accelerate cognitive decline. Another study pointed to the benefits of using hearing aids to aid cognitive development. The paper spearheaded by Isabelle Mosnier of Assistance Publique-Hopitaux de Paris in France looked at a group of older adults aged 65-85 who had hearing problems. They were given hearing aids and after a year, 80% improved their cognition scores. Although a handful of studies such as these do not make for an overall scientific consensus on the effect of hearing loss on Alzheimer’s, some are already suggesting we act. “the improvement in cognition (for the previously cited study) was huge — about double that seen with any of the current [U.S. Food and Drug Administration] FDA drugs for treating Alzheimer’s.” Remarked P. Murali Doraiswamy, M.D., a professor of psychiatry and medicine at Duke University School of Medicine and co-author of The Alzheimer’s Action Plan. He mentions that not many doctors make the same connection, when they should, something he calls a ‘big missed opportunity’. He concluded by saying that treating cognition with hearing aids should be made a bigger priority. How we can help prevent dementia? Although the lack of conclusive studies makes it tricky to act on preventing dementia, there are some things we can say. 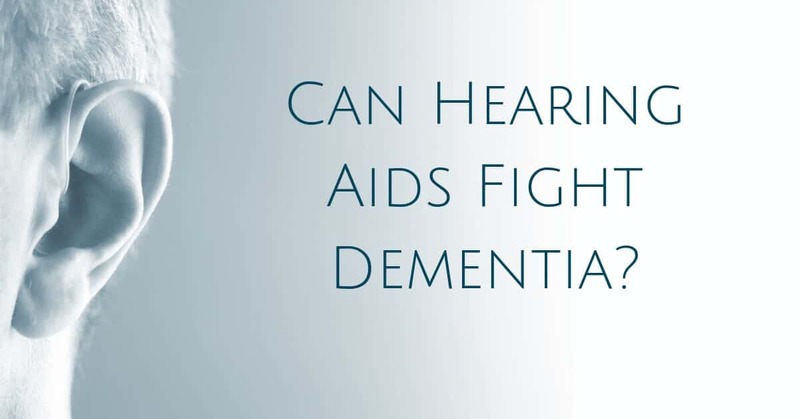 One of the effects having hearing loss can also explain the risk of dementia developing. People with hearing loss tend to be more socially isolated as they are unable to understand what people were saying when outside in noisy environments like bars and restaurants. As such they might stay indoors more often and see fewer people as a result. And being socially isolated has been noted for several years as a risk factor for cognitive decline and dementia. Hearing aids can help those with hearing loss go outside more. Many now come with features to help with understanding in noisy environments so users needn’t feel concerned about meeting friends in these environments. High blood pressure and obesity are risk factors for Alzheimer’s. So, it makes sense to get out when you can, do 30 mins of mild exercise and eat a healthy diet. While hearing aids can’t help with the latter, they can help your already existing active lifestyle. Many come with sweat and dust resistant casings, and some even have noise reduction systems to block out the wind if you are riding a bike in the forest or sailing the open waters. Current numbers suggest only 20% ofthose who need hearing aids actually own them. This is probably because, on average people wait up to 7 years before seeking help with their ears. Until future studies confirm or deny the link between hearing loss and dementia, it’s best to play it safe. Get you hearing checked and get it treated if it needs to be. It could save you further down the line. Schedule a test with Coweta Hearing Clinic today!